Football, like our real lives, has its ups and downs, and we can’t ignore either. So while I have some reservations about the new developments in the Oregon offense, I do acknowledge that some good things are happening and I wish to cover them, too. But in short, I do not believe you should deviate from the CK/MH offense if you cannot duplicate the results or improve upon them with a new system. This new offense will be a major step down in scoring, IMHO. And I sure-as-heck don’t get Cam McCormick’s hair either! Yes that is true, and the offensive success that I studied so much is the baseline of what I expect from this new coaching staff. Mark Helfrich hired badly on defense, and Coach Mario Cristobal has solved that issue. 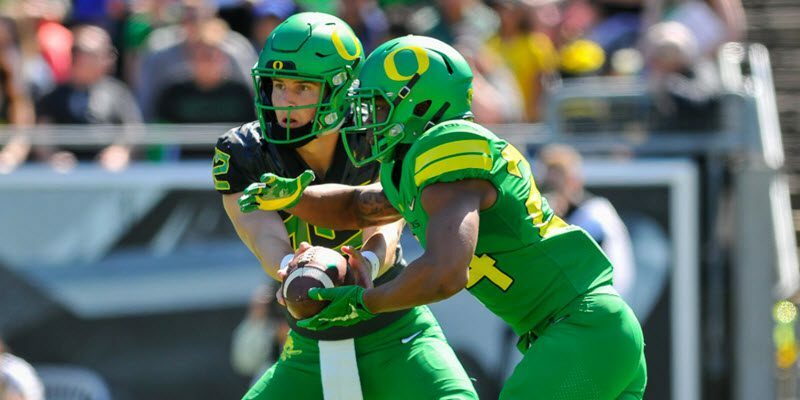 But the question now is truly about the offense, and I wish to share some thoughts on its changes, even though I may look later like the canary in the Autzen tunnel or like Chicken Little, clucking over nothing. This is simply the beginning, as we will study and ponder the offense throughout the spring and summer, and perhaps by fall camp my views will be completely changed. There is a lot to like about the increased physicality of the offensive line and the use of basic fundamentals—like getting your pad level low and driving with your legs, since arms on defense are not as strong as the legs of offensive linemen. Quite a few defenders around the box! 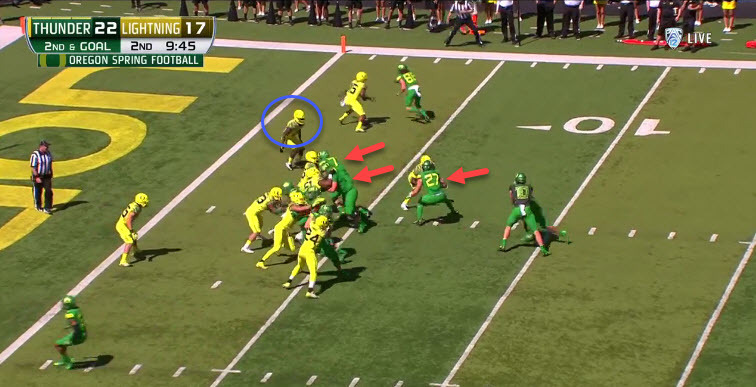 In the screenshot above, you see that the Ducks have six defenders inside the box and the safeties are crowding the box area, making eight total stepping up to stop the run. 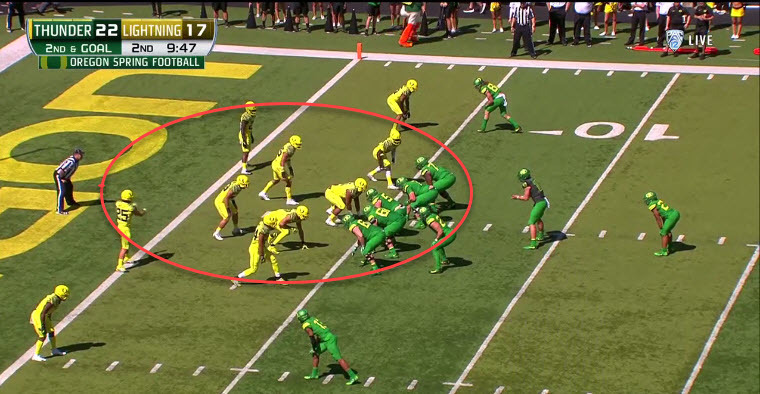 The Oregon offense has five offensive lineman and a sixth blocker in the H-back. CJ Verdell is in a deep Pistol formation and the play we are about to see is the new version of the Inside Zone Read, only it is shot from the Pistol. Superb line surge and drive blocking! The screenshot above illustrates what to watch for in the upcoming video. The defender on the far right on the LOS for the offense (the OLB) is left unblocked by the right tackle, and the H-Back comes over (No. 27 Jacob Breeland) to block him. Next, you’ll note above that the QB is looking at the safety (blue circle), and since the safety is sitting, the QB hands the ball off to the RB. This blocking scheme allows the right tackle to block “down” or inside and allows a big offensive tackle to smother a linebacker. The right guard can then block “down” on the nose tackle, and you can see the linemen trying to get their pad level lower and drive with their legs. Having a low center of gravity and powerful legs makes for a good combination inside the five-yard line. Verdell explodes through the gap so that the defense’s arm tackles are ineffective. What you see above is something I love as an old offensive lineman. My concern is that the new outside running attack is typical, whereas before we had explosion plays with Outside Zone Reads and Sweep Read plays, such as against Utah and Arizona. The outside running plays in this Spring Game had pulling linemen to the playside and Zone Reading on the playside. What is the result? All the defenders are massed on one side, cutting off cut-back running lanes. The players are not aligned to create the “big-plays” we saw in previous offenses. I am going to be a harsh critic because Oregon led the conference in rushing for ten years (and was second in the eleventh year) under our old coaches. Shouldn’t this new running attack with better blocking fundamentals achieve just as much? Or will the scheme hold them back? Redshirt freshman Daewood Davis (above) is not just running a route; he is the receiver, and goes wherever is necessary to make the play. This shows a ton about his natural aptitude as a football player, and it was not his only highlight from the game. He had an amazing, athletic TD catch on the sideline, along with a first-down catch on a disciplined hook route to keep a drive alive. I wrote last fall about the receivers on previous Oregon teams that won seven, eight, nine and ten games. Go look at these receivers of the past, and tell me honestly: Would you want this current 2018 group over any of those? (And we are not talking about NC teams either). Byron Marshall hauls in a pass against Ohio State in the National Title game. Everyone knows how great Marcus Mariota was, but he was throwing to Charles Nelson, Darren Carrington, Devon Allen, Keanon Lowe, Byron Marshall, Bralon Addison and Dwayne Stanford. Do you think it makes a difference? How good would Justin Herbert look if he was throwing to those receivers? Speaking of which—Did you note what was going on at the Spring Game with Herbert? He was forcing throws because his WRs were not open. Most of the passing TDs were against the second and third team defensive backfield, but Herbert faced the teeth of first defensive unit the majority of the time, and his receivers simply did not create separation. The combination of fewer explosion plays in the running game coupled with a “challenged” passing game points to a low-scoring offense. This is like Oregon State hiring the OC of the then-reigning National Champions and expecting the same success in Corvallis. Craig Fertig didn’t last long; will the Alabama clone really do better than what we had? 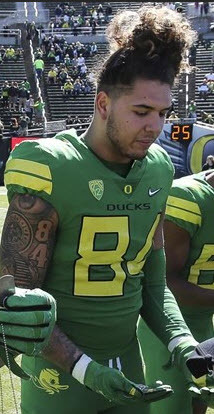 Although the original CK/MH offense was used to score a ton of points last season at times, you did not see any of it in this 2018 Oregon Spring Game. It is officially dead to us and this team, and I find burying something that has worked so well to be troubling.